Ecoquel FMZ - Kenya Biologics Ltd.
ECOQUEL FMZ is a balanced blend of L-amino acids with iron (Fe), manganese (Mn) and zinc (Zn) for the prevention and correction of mineral deficiencies and crop improvement. The application of this product prevents and corrects the essential mineral deficiencies in plants. Especially recommended for calcareous soils. 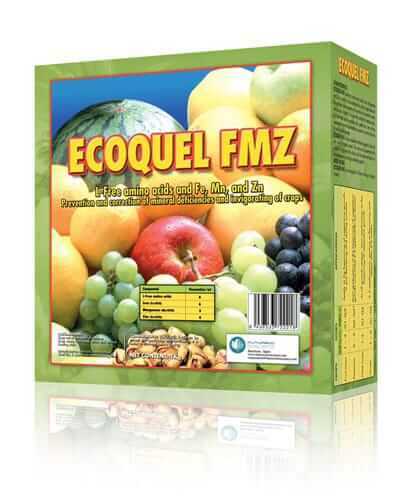 ECOQUEL FMZ provides high nutritional support to soils with low organic matter. Amino acids present in this product improve crops and increase the availability of trace elements due to their chelating properties. ECOQUEL FMZ can be applied by foliar spraying or through irrigation systems. ECOQUEL FMZ is stable for at least four years since manufacturing date. Store in the closed original container in a cool and ventilated area. DO NOT store for prolonged periods in direct sunlight. Keep away from food, drink and animal feed. Keep out of the reach of children. ECOQUEL FMZ is compatible with most pesticides and fertilizers used on crops where it is recommended. Whenever it is possible, perform a compatibility test in a small volume. Fruits 0,1 – 0,3% 1 – 3 kg/ha Apply at the beginning of vegetative growth in the pre-flowering and summer. Pistachio 0,2% – 0,3% 2 – 5 kg/ha Apply at the beginning of vegetative growth and make 2-4 applications at the beginning of vegetative growth. Field crops 0,1% – 0,2% 1 – 3 kg/ha At all the stages of growth, start the application at the beginning of vegetative growth. Grapevine 0,1% – 0,2% 1– 3 kg/ha Apply 3 to 4 times starting in bloom and repeated after 3 to 4 weeks.